There are various important developmental milestones in a newborn’s life, one being the time at which they are able to grasp and hold objects. 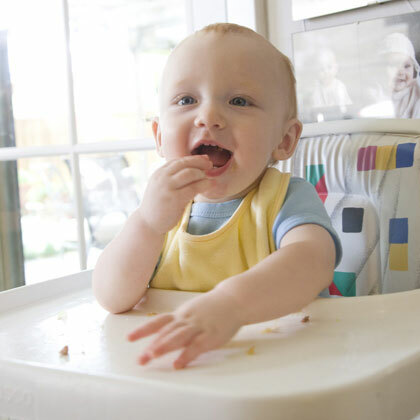 Grasping development in baby not only makes playing more fun for the baby but also helps him develop more advanced skills such as using a fork or spoon and manipulating small toys with their hands. Grasping is also one of the steps that your baby takes towards doing things by herself such as brushing their teeth, reading, writing and drawing. Read on to learn when and how grasping develops in your baby and how you can assist him in the process. There are two types of gripping or grasping that develops in a baby known as the pincer grasp and the palmar grasp. The palmar grasp is characterized by using the whole hand to grasp an object and pick it up or hold it. In the pincer grasp, the infant uses his first finger and thumb to pick up and hold an object. Newborn babies have an innate capability to grasp things; however, it requires at least a year for them to develop coordination for picking up and holding things securely in their hands. Babies start developing grasping by 3 months, which becomes better with each passing month. Newborn babies have an innate grasping reflex; however, for the first 2 months, these movements are involuntary and instinctual. Till two months, babies usually keep their hands clenched in a fist, but they will also start to open and close them voluntarily. They may try to grasp soft things such as soft toys. By this time babies are still not able to grasp things accurately. Hand-eye coordination also starts developing in babies and they will try to notice things and attempt to reach for them. By 4 months babies are able to grasp and hold large objects such as blocks, but they are still not able to grasp small things such as peas. Between 4 and 7 months, babies start picking up things and put them in their mouth. Babies, who are eating solids by now, will try to hold a baby spoon. They can now move an object towards themselves and can move objects between their hands. Hence, it is essential that you baby proof your house at this stage. Babies will be able to pick up objects by this time. Their preference for using the right or left hand starts emerging; however, it develops fully by 2 to 3 years. The pincer grasp also develops by this age and your baby will start picking up small objects between her forefingers and thumb. The coordination is also increasing, making it easy for babies to hold spoon or fork during mealtimes. Once a baby develops grasping, she will enjoy throwing her toys. Your baby will be able to play ball, stack towers and bang things together by the time she turns one year old. Your baby will be fascinated by using crayons to draw and write by the time she turns 18 months old. By 3 years she will develop enough coordination to write letters and may even write her name. Provide your baby with plenty of dangling objects, in her crib, in front of her infant seat etc. Your baby will try to grasp them. You can use portable bars, which hold dangling toys perfectly. These bars can be placed in on an overhead blanket or in front of her infant seat. You should let your child bear weight on her hands, such as by lying on her tummy and pushing her hands. You can also encourage your baby to bring her hands together and grasp her own hands. You can also place different objects of varied texture, shape, size and weights in her hand to let her hold them. You can assist in developing the grasping reflex in your baby by putting a toy out of her reach and asking her to grasp it. You can provide her objects that she can grasp easily such as plastic rings, soft toys, and board books. When your baby is developing pincer grasp, you can assist her by encouraging her to pick up soft finger foods such as cooked carrots and peas. By 18 months, your baby will be able to put the objects she has grasped into other things. You can encourage this by letting her put objects in empty boxes, containers or plastic cylinders. Piggy Bank is a favorite among babies and they love to put coins in them. It actually consists of grasping, reaching and letting go. Babies learn to grasp a coin, take it to the bank or coin slot and then let go the coin by opening their hands. To put the object into a box such a coin in a coin slot, she must reach to the slot with the coin grasped in her hand and then release the grasp and let go the coin, by opening her fingers. You should be concerned if your baby shows no interest in toys or another object put in front of her by the age of 2-3 months or she is not able to grasp objects by 3 months or she does not touch or pick an object by 3 to 4 months, then you should discuss with your doctor. The milestones may be delayed in premature babies and you should discuss with your doctor regarding this.